"The Lantern and Katherine get 5 stars from this AAA travel agent. Rooms are very large, tastefully decorated, and the power shower has to be the best in Ireland. The Lantern is located in the heart of Dingle and a five minute walk to any restaurant, pub, shop, etc. We stayed in rooms 7 and 8 on the back side of the townhouse and it was very quiet. Katherine is extremely helpful and made many calls for us to make arrangements for various activities. She has a nice display of brochures available in the lobby listing local pub musical events and attractions in the area. Actually she couldn't do enough for us! 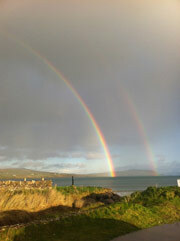 So thanks again and definetly put on your list if traveling to Dingle."